Thousands of potential students visit our website every month. Shouldn't they be finding YOU here? Many visitors arrive at our pole dancing directory every day, searching for a studio or a party company in their area. We also get frequent email requests from visitors looking for pole dancing classes or parties in their area. What makes this pole dance directory different from all the others? You get a full page that you can use to showcase your business. There's room for lots of information, up to 400 words with our free Basic Listing, and unlimited words with the Premium Upgrade. Your students can visit your listing and leave a comment or testimonial about their experience with you. This helps future visitors feel more confident contacting you because they know you already have satisfied customers. You get a relevant, high-quality link back to your site (the best kind!). Social Networking features are included with every Showcase Listing Page, to help you get the word out about your Showcase Page and your business. Just click to Tweet or Share on Facebook! A Premium Listing gives you even more benefits. Just review the chart above to see all the extra goodies you'll get! Ready To Create Your Showcase Page? Please make sure you read and follow the guidelines in the submission box below (they will appear once you enter your studio name). Unfortunately, we must decline more than half the submissions we receive because they don't follow our simple guidelines. And we just don't have the time to track you down and ask you to re-submit. Bottom line: if you read & follow the guidelines, you'll get a free Showcase Page listing in this directory. If you don't, you won't. Just fill in the form below. We'll send you an email confirmation once your listing has been approved, along with info on how to upgrade to a Premium Listing if you like. Please use correct capitalization, spelling and grammar, as this projects a more professional image for your business. Also, please DO NOT use all caps as this is very hard to read. We do NOT do any editing or corrections for free listings. A minimum of 300 words is recommended for search engine optimization. 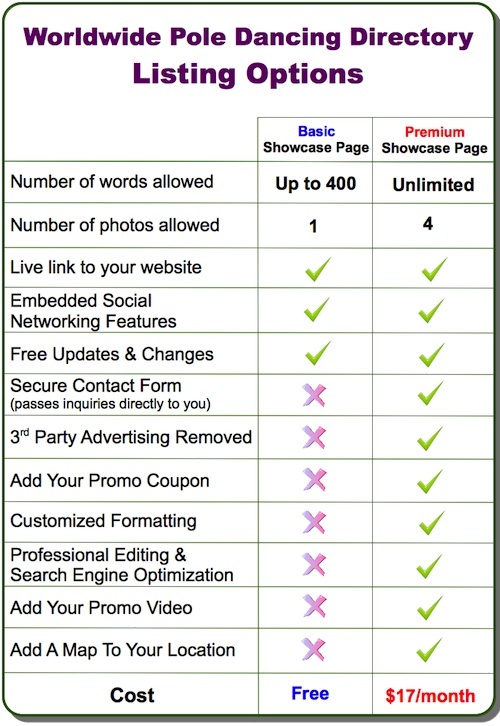 You may have up to 400 words for a free Basic Listing, and unlimited words for a Premium Listing. REMEMBER: Listings with no contact information will be rejected, as we cannot respond to inquiries received via our website. A picture or logo adds visual appeal to your listing, helps brand your business, and helps visitors connect with you. Basic Listings may upload ONE photo or image file. Please note that if you upload more than one, we'll allow only the first one you upload and the others will be deleted. Premium Listings may upload up to 4 photos. Just be sure you have the rights to use the photo or graphic, and that it's of decent quality in order to reflect well on your business. Just click the "browse" button to find it on your computer. Then select it. Some of the studios listed in our directory appear below. You can also search the directory to find a specific studio.